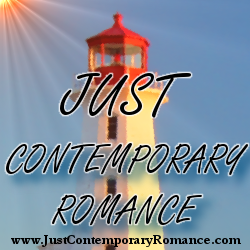 Just Contemporary Romance: Are You Hooked on Horoscopes? Are You Hooked on Horoscopes? Ever since I was a teenager and an avid reader of the Cosmo Girl's Bedside Astrologer, I've been hooked on horoscopes. I don't know what it is about them that does it for me. Maybe I like having a little encouragement every day, a little map to success to follow. Or perhaps I'm looking for an excuse. If my horoscope suggests I lay low, maybe I should spend the day reading in bed and skip the gym... It's also possible I'm looking for a scapegoat. After all, I'm an Aries, a fire sign, quick-tempered and impatient, so if I blow a fuse, is it really my fault? Or can I blame my inner ram? Today's horoscope advises me to “Ask for favors and offer something in return.” My husband is going to love this one! I can only imagine what “favors” he'll suggest, but my prediction is super-appropriate as I'm writing blogs and dreaming up giveaways for my new book IMPULSE CONTROL, the first book in the Men of the Zodiac Series from Entangled Publishings. My hero is an Aries, of course! How could I resist writing my own sign? He embodies all the best traits of Aries: adventurous, energetic, courageous, pioneering, quick-witted, and dynamic. He's the star of a wild Bear Grylls-like reality adventure show, and he and the heroine, his total opposite, a Martha Stewart-type with a TV show of her own, strike immediate sparks. Of course, he also exhibits the worst traits of Aries: selfish, quick-tempered, impulsive, impatient, foolhardy, and daredevil. Since he and the heroine constantly challenge each other, the tension gets fierce fast! An Aries likes to be in charge but also needs a partner who will give as good as she gets. I like to think I created the perfect match for Russ Donovan, the Wild Man. Susannah has a deep nurturing streak, but she has absolutely had it with men who try to walk all over her. 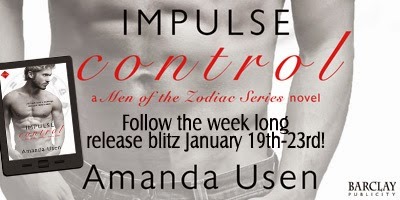 I hope you'll check out IMPULSE CONTROL and let me know what you think about the love match. What about you? Do you read your horoscope and identify with its traits? Do you use it as a scapegoat or an excuse to do something you wouldn't normally do, as I do? Giveaway: Today's Aries horoscope tells me “Give-and-take will get you closer to the personal or professional goals you have set.” Since collaboration is clearly written in the stars, I invite you to participate in the GIVEaway I'm having to celebrate the imminent release of IMPULSE CONTROL. Just stop by my website the week of January 19th and enter! I'm giving away tons of print copies of my backlist and the ENTIRE Zodiac series of e-books, one every month as they release from Entangled. I hope you'll TAKE my news into your world and tell all your book lover friends about IMPULSE CONTROL! Amanda Usen knows two things for certain: chocolate cheesecake is good for breakfast and a hot chef can steal your heart. Her husband stole hers the first day of class at the Culinary Institute of America. They live in Western New York with their three children, one gerbil, four fish, a Russian tortoise, and a beagle. Amanda spends her days teaching pastry arts classes and her nights writing romance. If she isn’t baking or writing, she can usually be found reading a book and trying to get out of cooking dinner. I'm an Aries, and yes, I definitely think I hold some of its traits.